After a three month trans-Atlantic journey where I had the opportunity to experience music and dance from around the Mediterranean, Africa, South America and the Caribbean, I am very excited to return to Portland and resume teaching belly dance! Cost: $100 Full session /$15 drop in. 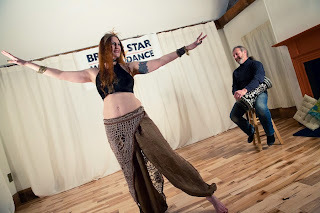 Each class includes work with foundational belly dance movements and improvisational theater exercises. We will be using both live and recorded music in class. NOTE: The classes are open to beginner and intermediate belly dance students who have attended at least one session of belly dance classes. Students will need to dress in comfortable clothing that allows a wide freedom of movement.